Marjorie Glick is known for her large scale and vivid realism watercolors that are inspired by New England’s places of antiquity and by the beauty found in nature. She has been painting for 30 years and has exhibited at several regional museums and galleries including the DeCordova Museum, Berkshire Art Museum, Brockton Art Museum, Beth Urdang Gallery, Boston, and the Forum Gallery in New York. Her work is in over 40 corporate and private collections including The Federal Reserve Bank, Fidelity Investments, Brigham and Women’s Hospital, Tufts-New England Medical Center, all in Boston; Friends Hospital, in Philadelphia. 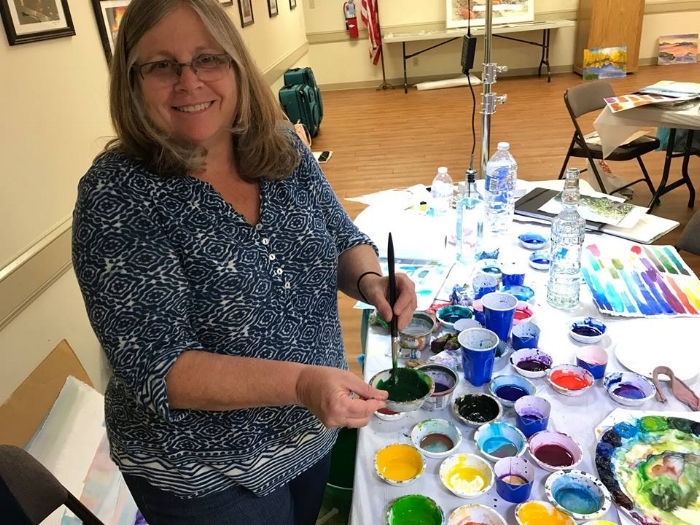 She is the recipient of grants from the Berkshire Taconic Community Foundation (Artist’s Resource Trust Grant) and the Massachusetts Cultural Council. She has served as Adjunct Faculty for The Art Institute of Boston at Lesley University and was a member of the faculty of the DeCordova Museum School, in Lincoln, MA from 1986-2012. She leads plein air workshops each summer in Maine, Monet's Garden in Giverny, France, and Tuscany. Her work has appeared in the following publications: Splash 11—New Directions: The Best of Contemporary Watercolor, by Rachel Rubin Wolf (North Light Books, 2010) and Watercolor Artist Magazine, feature article, Once Upon a Time by Meredith Lewis October 2010. She holds a BFA from Massachusetts College of Art and has studied independently with Wolf Kahn and George Nick.